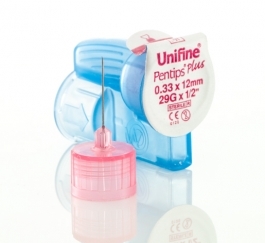 Built-in remover holds used pen needle until it can be disposed of in sharps container. Ergonomic design preferred by those with dexterity issues. Sharpened to perfection for lower penetration force. Anti-coring treatment for decreased penetration force. Electropolished and treated with advanced silicone for exceptional comfort. Thin-wall technology for improved drug flow and low delivery force.